The last General Revenue stamps of Imperial Russia, issued from 1907 onwards on unwatermarked paper, were printed in sheets of 80, with two panes of 8 x 5 side by side separated by a central vertical gutter. Within each pane the top four rows are organised tete-beche with (as it were) half a tete-beche in the bottom row. Quite why such a complicated sheet make-up was selected, I don't know. The first image shows a strip of eight with selvedge at the right showing that it is from the left of the sheet. The Arms are printed low down in the upper half of the stamp but the value is in the middle of the bottom tablet (along with later Mss revaluations which turned Zakiyan # 16 into Zakiyan # 23). In the second image, what is probably a divided strip of eight shows the Arms a few millimeters higher than on the first strip but the value overprints still centrally placed. In other words, the two overprints are independent of each other from two plates. Closer inspection shows that the form of the value "1 rf" varies from stamp to stamp. In principle, it is plateable and if a plate of 5 x 8 was used, then it should be relatively easy - a plate of 10 x 8 is going to be at least twice as hard! 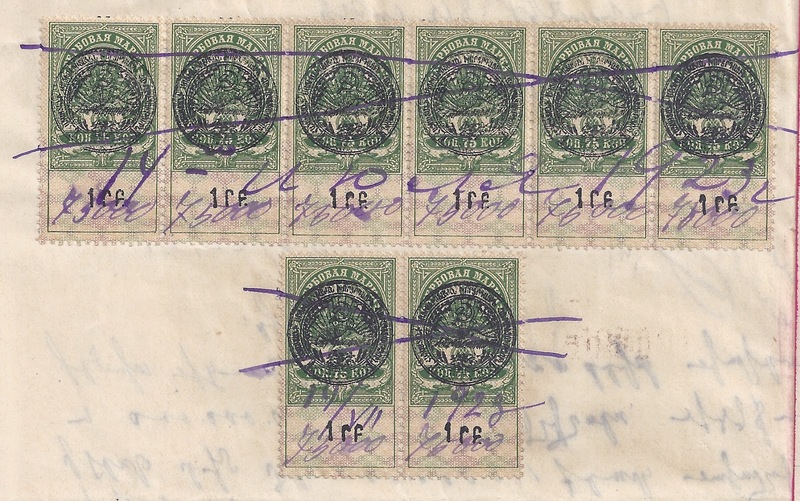 Meanwhile, the examples above show how Armenian documents of this period (1923) are often attractively franked with multiples of the same revenue stamp.